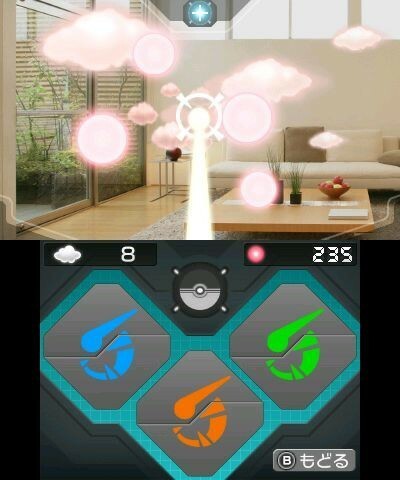 Pokémon Dream Radar classes as a first-person shooter that makes use of augmented reality and is a single player application for the Nintendo 3DS. The app is known as Pokémon AR Searcher in Japan. 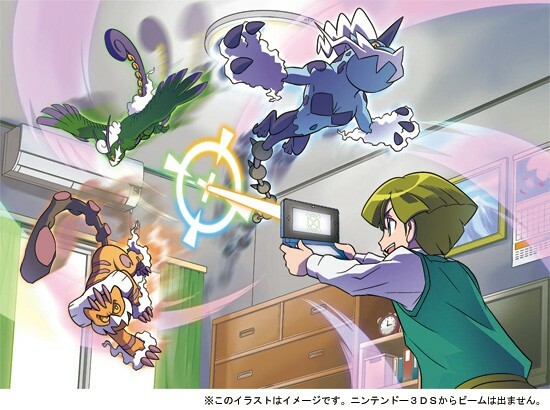 The game works by moving your 3DS around (making use of it's motion sensors) in order to take aim at Dream Clouds using a lightbeam and hit the target to get a reward. The title enjoys compatability with Gen V games: Pokemon Black & White Version 2 meaning items and Pokemon can be transferred to/from Dream Radar from these titles. In the game you'll be taking on the role of an assistant who works for Professor Burnet - a scientist studying the Interdream Zone. Move your Nintendo 3DS system around in this motion-controlled action game and take aim to shoot your light beam at the Dream Clouds and collect your rewards! This game is fun for anybody, and a fact-filled accompaniment to Pokémon Black Version 2 or Pokémon White Version 2. Any caught Pokémon or items you pick up in the Pokémon Dream Radar can be transferred to Pokémon Black Version 2 and Pokémon White Version 2, which is very useful, since the Pokémon you catch might have hidden abilities not available for those games, and some items that can't normally be found either. Try to fill up your Pokédex as much as you can! Professor Burnet is a key character within the game, she's studying the Interdream Zone but in order to continue her research she needs the player to collect Dream Orbs so that she can study them further. Under the guidance of Professor Burnet the player enters the Interdream Zone and begins the process of harvesting Dream Orbs which is done by moving the 3DS around in order to aim the light beam at the Dream Clouds and destroy them. Pink Dream Clouds - These clouds get larger and smaller intermittently. Hit one of these and it'll break up into between 3 and 5 Dream Orbs. If the cloud was at its largest when destroyed you'll more likely get more Dream Orbs. Stormy Clouds - These clouds will sometimes glow Yellow. Sometimes these clouds will contain Pokemon instead of Dream Orbs. When a player hits a Pink Dream Cloud at it's largest and it breaks into 4 or 5 Dream Orbs, the last one you hit will cause it to break into a further 3, and the last one will again break into a further three. Harvesting Dream OrbsEach time this is repeated the Dream Orbs have a lower duration however so you have to be quick to maximise this. Once the player has succesfully harvested all of the Dream Orbs they can they leave the Interdream Zone and the clouds begin to regenerate ready for the players next visit. The first cloud regenerates instantly where the other clouds regenerate at a rate of one every five minutes. The player can return to the Interdream Zone; harvesting more Dream Orbs and increasing their chances of finding Pokémon a maximum of three times per day. Players who don't wish to wait for all the clouds to regenerate can use 5 Play Coins to instantly restore all of the Dream Clouds. Said Play Coins are accrued when the player walks with their Nintendo 3DS console, the systems pedometer counts the number of steps you take and gives you coins every time you do X many steps. No putting the 3DS on the top of the washing machine please guys. 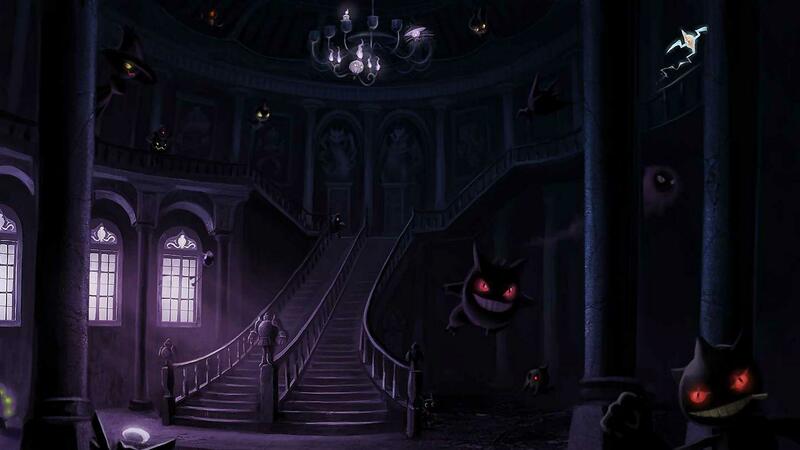 In addition to this the game will begin to record statistics in the background of how many of each colour Dream Orbs you are obtaining, and this will have an effect on the type of Pokémon you encounter. Sometimes when you hit a Dream Cloud you'll find that instead of breaking into Dream Orbs, you'll instead reveal a Pokemon that has become trapped in the Interdream Zone. 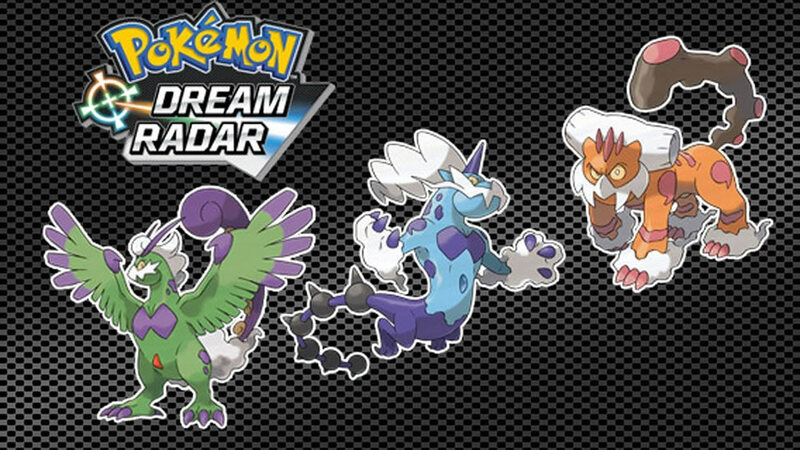 At this point the Dream Orbs will disappear and the Pokémon will be in a glowing sphere, except for Tornadus, Landorus and Thundurus who will appear in their Therian Forme, a form they have taken on in order to adapt to life in the Interdream Zone. A timed battle with the Pokémon will then take place, the Pokémon will shoot projectiles at you and every succesful hit on you will reduce the time remaining to capture it. In the mean time the player needs to keep hitting the centre of the sphere with the lightbeam until the capture gauge is full at which point you'll be able to catch that Pokemon, or it'll at the least give you an item, the Pokemon or Items data will then contribute to Professor Burnets research which can then be transferred to Pokemon Black & White Version 2 if it's game card is present in the system. As the player plays the game the app utilises an auto-save feature at each milestone, a good little insurance policy if you've had a day of Orb grinding. These are the 26 different Pokemon you can obtain via Pokemon Dream Radar, all of which have their own Hidden Ability with the exception of Rotom. All of the Pokémon are encountered in their spheres with the exception of the Forces of Nature trio who will be free flying. Tornadus Regenerator Flying Complete the Eureka Extension A Objective and acquire a total of 400 Dream Orbs. Flying Complete the Eureka Extension B Objective and acquire a total of 1500 Dream Orbs. Flying Play PDR while Pokemon SoulSilver gamecard is in the system. Flying Play PDR while Pokemon HeartGold gamecard is in the system. Dragon Play PDR while Pokemon Diamond gamecard is in the system. Dragon Play PDR while Pokemon Pearl gamecard is in the system. Dragon Play PDR while Pokemon Platinum gamecard is in the system. What Level will Pokémon be when I transfer them? The Pokémon all dwell within Dream Balls, even when transferred and if you view their info it'll show the location you met them in as 'Pokemon Dream Radar'. In terms of Legendary Pokémon, you are limited to one Legendary Pokémon per PDR save game, likewise you are limited to one inbound transfer of a Legendary (from PDR) in a Pokemon Black & White Version 2 save game. 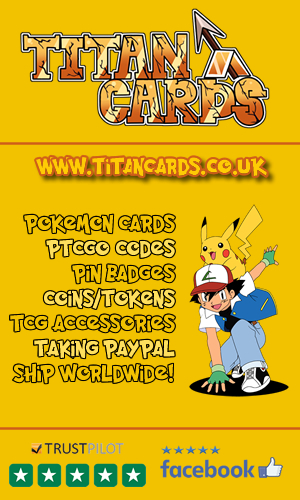 These are the items that can be obtained from Pokemon in PDR. The development lab is an area in which your equipment can be upgraded in order to become more powerful, you can also purchase standalone inventions by Professor Burnet in exchange for Dream Orbs - some of these will be permanent where some things are single use only. All of these upgrades can be performed to a max of level 5. Every Pokémon you catch and item you obtain gets stored as research data. In the research data storage facility a player is allowed to stack 6 different items and 6 different Pokémon for storage at any one time. If in the instance a player already has 6 item stacks or 6 Pokemon and they then get another they'll be prompted to replace something thats already stored. If the player is at capacity when they click the Start search button a warning will be shown. A maximum of six Pokemon can be transferred to Pokémon BW2 at any one time, where there are more than six stored, Legendary Pokemon will take priority and will always be transferred. Once the mons are transported from Dream Radar to BW2, the player must access the Unova Link in order to recieve them ingame. A player must load up BW2 and recieve the Pokémon before any additional ones can be sent. In Black and White 2 all recieved Pokemon will be put into storage on the Current PC Box, or wherever the first box with free space is after that. Items will automatically land in the players bag. Check out the below videos including the USA, UK and Japanese Trailers for PDR. 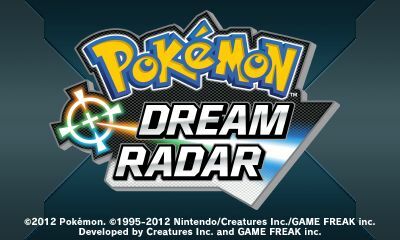 Pokemon Dream Radar had the exact same release global release date as Pokemon Black & White Version 2. Pokemon Dream Radar recieved a lukewarm reception with mediocre scores and a few mentions of tedium, heres how it did at some of the major review outlets. Over at Metacritic PDR comes out with a score of 54/100 across 13 critic scores and has a user rating of 5.8/10 over 24 votes. Joe Walker from Nintendolife scored the game 6 out of 10, equating to 'Not Bad' on the NintendoLife scale and quoting "Pokémon Dream Radar is a fun diversion for Pokémon fans that ties in well with the newly released Black and White 2." 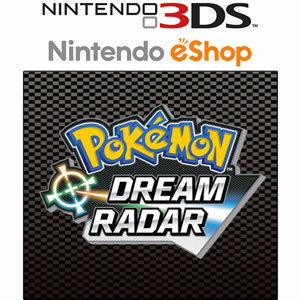 IGN likewise didn't bother reviewing Dream Radar because it was seen more as an addon than a title in it's own right. 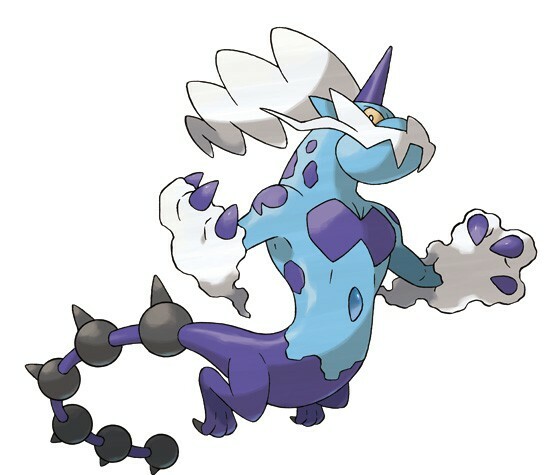 I think a major part of the problem was that unless you were avidly into Pokemon Black or White Version 2 at the time you played Dream Radar then there is/was limited point Thundurus, one of the Forces of Natureto the app as a standalone and I completely understand how it would become tedious, however if you were active playing B&W Version 2 its a really cool little addon.